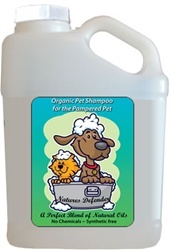 Cedar Oil Pet Shampoo, GREAT protection for your pets...and kids with head lice, who knew!?! 1 gallon - a GREAT buy if you have lots of pets or are a groomer! Of course, as standard poodle breeders, Dani and Tes use this during all the spoo baths. Yes, we do all the grooming here in our homes...if you can't, purchase and TAKE to your groomer for an organic product, free of chemicals!